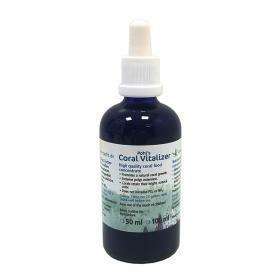 Coral Vitalizer is the new food Korallenzucht studied by highly concentrated and of higher quality. This food has the characteristic of having the food for corals in both liquid and solid, favoring the power not only to SPS, but also to many species of soft corals. From the time of administration we see the first results already after 7-10 days, passed this stage, corals begin to assimilate optimally Coral Vitalizer noticing an increase of the expansion of polyps. Polyps of acropora rimaranno turned outward during the daylight hours. Corals mantle with a more stable their color naturally. Increase the growth of corals. The evagination of polyps will be most stimulated.